It’s not often that one gets to travel back in time, but thanks to Google (what can’t it do?) I have done just that, and re-witnessed one of the great eras in Broadway rush history. During a short bout of procrastination, I was fooling around on Google Maps, using the “street view” function. Since it’s way too cold to take an actual walk through Times Square, I thought it’d be pleasant to go for a virtual stroll instead. While I was “there,” I was looking for clues to discover around what time the photography of the area was taken. 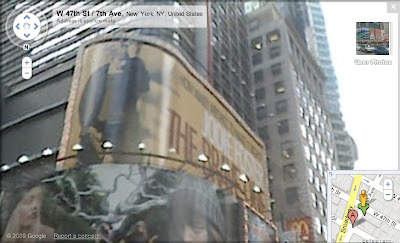 Warner Bros. owns the billboard space that hangs above 7th Ave and W 47th St., and that space always advertises the company’s current major release. Low and behold, it was The Brave One, which was released in September 2007. My mind immediately jumped to Spring Awakening, which recently (and sadly) closed on Broadway. I thought, Wouldn’t it be nice to see the old marquee once again? I decided to “walk” over to the Eugene O’Neil Theatre on 49th St. Once I “arrived,” what did I find there but… the student rush line!! 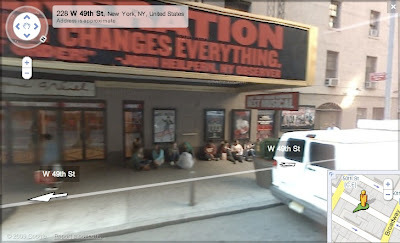 Which means the photographs were taken in the morning, since rush tickets went on sale when the box office opened. It was nostaligc to see the Spring Awakening student rush line, since I’d rushed the show 11 times (seen the show 18 times though). Spring Awakening‘s rush policy was not only one of the best offered (tickets were always available, and ususally in the first few rows, extreme right and left), but it was also one of the most popular. It’s also special to see the original posters, featuring original stars John Gallagher Jr., Jonathan Groff, and Lea Michele (before they were later replaced by Blake Bashoff, Kyle Riabko, and Alexandra Socha). Thus concludes today’s lesson in Broadway rush history.